Business Cards and the Granada Grand Festival of the Arts! As well as finally getting my site up to date, I’ve also finally gotten around to making some business cards. I ordered them from https://www.moo.com/us/ and couldn’t be happier with the results. Totally customizable, and very reasonably priced for the quality you get. 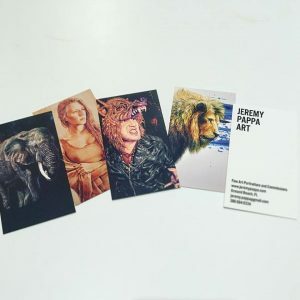 I’ll have a booth tomorrow, Saturday September 17, at the Granada Grand Festival of the Arts by the public library here in Ormond Beach, FL, so come see my work in person and pick up a card! The event goes on from 10AM-5PM and I’ll just be one of a great many local artists and vendors.